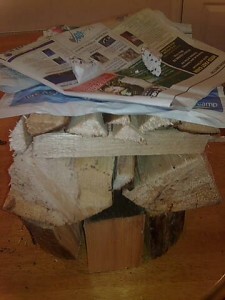 When setting the fire, put a layer of large logs across the bottom. Then a layer of smaller logs above this. Then layer of sticks in the opposite direction. Then two layers of dry kindling, each in opposite directions. Then a layer of ripped paper with fire lighters on top. 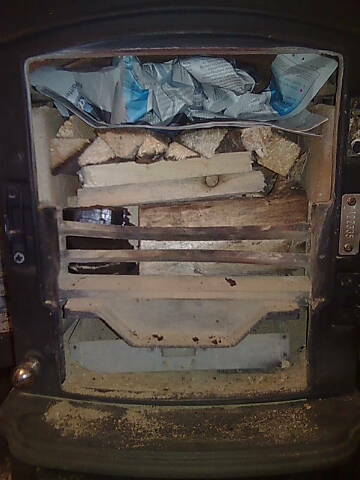 My stove isn’t big enough for all these layers, I only had one layer of logs on the bottom row. The principle seems to be that because the fire is burning from the top, it burns for longer. Like a candle it only burns the timber at the top at any time. A normal fire is started from the bottom and shortly afterwards lighting, all the timber is alight at the same time. 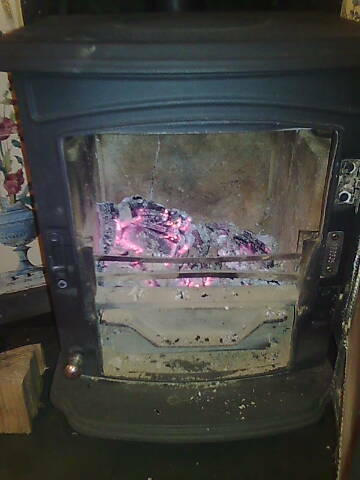 With the upside down method much less ash is produced as the embers from the top fall though the successive layers and are thoroughly burnt. 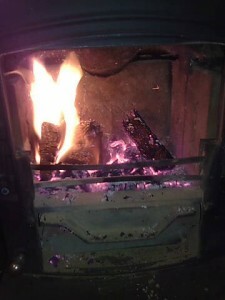 In a regular fire the first embers produced are at the bottom of the fire and simply fall through the grate once they are small enough, whether they are completely burnt or not. 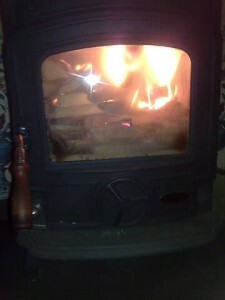 I did all this, lit the fire lighters, (at the top), and noted the time. It burned slowly for a while and then took off….slowly; I had to open the stove door for a few minutes to get the fire to take properly. It gradually burned through the layers of wood and it took an hour to reach the lower layer. The heat given off was good and I probably used less wood overall. 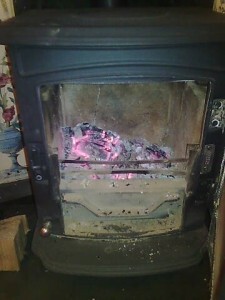 More wood is used at the start than usual but none is added, compared with a regular fire where less wood is used at the start and more is added during. 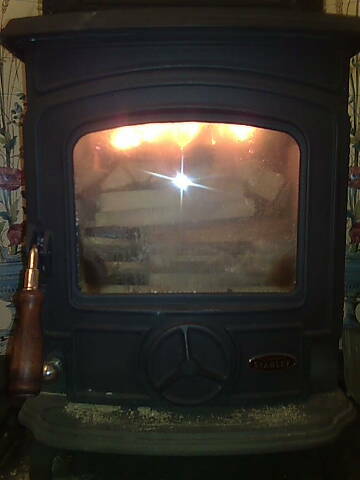 It was two hours and twenty minutes before I had to put the first log on the fire and as I said earlier it would last a lot longer in a larger fire or bigger stove. It’s definitely worth doing, especially if you are busy in the house and don’t want to be checking the fire that often. However it is of more use with an open fire, where there is little control. A stove is controllable and the fire burn rate can be slowed to a certain extent by restricting the air inflow through the adjustable valve. Thanks for the simple and great information. Very detailed and very easy to follow! I never thought I’ve learned this kind of stuff in here. I wish to see more. Good thing you posted pictures for us to see. Many thanks! The problem with this is that the fire will smoulder along and produce a lot of smoke but not so much heat. The best way to use a stove is to get it up to a high temperature as quickly as possible, and then restrict the airflow. To achieve this, have the kindling at the bottom and leave the lower ashpan door open for a few minutes. Once the operating temperature is reached, restrict air intake to a portion of the “airwash” only, to conserve fuel. At higher temperatures, the combustion process (gasification) of wood burns particles and compounds efficiently which would otherwise contribute to the smoke, thereby obtaining some extra useful heat. Some of the latest stoves coming out of the UK have a double-glazed unit for the glass, as well as firebricks lining the inside. This is to help them run at high temperatures in order to comply with DEFRA smoke control regulations. Unfortunately this makes them a very efficient incinerator of wood, as opposed to a great room heater. I prefer a cast iron stove without firebricks, which type heats up quickly and then emits the most heat. When the fuel is burned, the fire goes out quickly, but if the fireplace/chimney breast is constructed of heavy masonry, it will continue to give off heat for 24 hours. A traditional chimney breast was often built as a stone internal partition wall, and could heat 2 rooms downstairs and 2 rooms upstairs overnight.